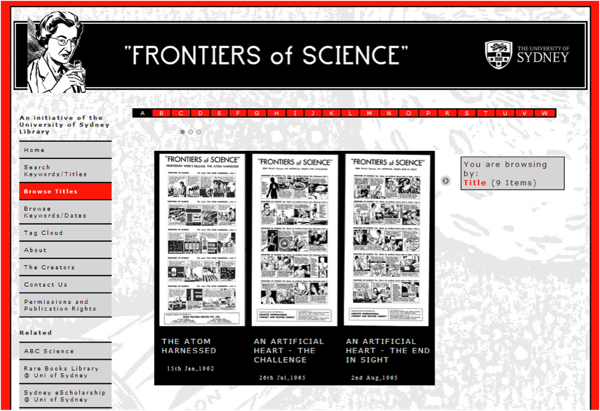 The Rare Books and Special Collections Library at the University of Sydney was bequeathed the rights to the original strips, or “pulls”, of the Frontiers of Science comic strips which were published in over 600 newspapers worldwide from 1961 to 1982. The series was co-written and produced by Professor Stuart Butler from the School of Physics at the University of Sydney and journalist and film-maker Bob Raymond. The early art work in the series was by Andrea Bresciani, continued later by David Emerson, with the aim of disseminating information about current topics in science in a novel and entertaining way. 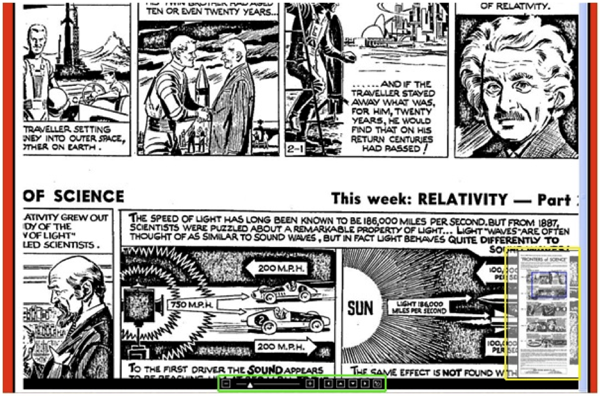 Having been given permission to digitize the original strips, Sydney eScholarship at the University of Sydney sought to make the Frontiers of Science strips available once again, this time online, for wider access by scholars and enthusiasts. Our goal was to offer simple, robust, flexible discovery tools including search, faceted browse and a tag cloud, combined with a novel display mechanism. There was an upcoming exhibition of Frontiers paraphernalia at the Australian Broadcasting Commission (ABC) in Ultimo, Sydney, which was to coincide with Science Week. We wanted the Frontiers of Science website to be launched to coincide with this, meaning the deadline at the time was 6 weeks away. Many tasks needed prioritization and consideration within the short time frame. These included but were not limited to: importation of the digitized pulls to the institutional repository, metadata tagging of the items, processing of images (for thumbnails and for use with the image viewer), processing of metadata, indexing of image metadata for browsing and searching functionality, creating the browse and search front-end, tag cloud generation, deciding upon and implementing an image viewer, presentation and layout design (within University style constraints), and developing the site, including associated historical and descriptive content and complying with (as far as practicable) W3C standards. To expedite the process, it was decided to rely heavily on technologies that we were already familiar with or that could be quickly integrated into existing (open source) architecture. The original Frontiers of Science material was bequeathed to the Rare Books and Special Collections Library of the University of Sydney by Angela Raymond and Miriam Butler. Here, they were scanned in black and white on a Bookeye scanner (BE3-SCL-R1) at 600dpi by Nicholas Heath in January of 2009. Each resulting archival TIFF file was about 400kB in size. The Sydney eScholarship Repository, the University’s institutional research repository, was used to archive the original scanned TIFF images. The repository employs a customized instance of the DSpace open source digital library software, which provides by default a facility for tagging items with qualified Dublin Core metadata. Most collections in the repository are tagged using the Dublin Core schema, so we decided to use this metadata schema to describe the Frontiers images. Tagging of the comic strips within the Sydney eScholarship Repository was completed by Professor Peter Harrowell from the School of Chemistry, University of Sydney. Due to time constraints, no controlled vocabulary was applied, so the metadata was less than ideal for data interchange purposes, but sufficient for our requirements of browsing and searching. Initially, about 200 pulls (each with one week’s worth of comic strips) were tagged with keywords, with the aim of adding more tagged strips over time, following the launch of the site. We decided that it would be simpler and more efficient to do all three tasks in one Java class, rather than creating and naming the files this way and then customizing the XTF prefilter to suit the XML file format. The main writeMetadata method of this class (see Code Listing 1 below) sets up the XML file for XTF by defining the root element as <dc>, the XTF default. Within the <dc> tags, we tested only for the following metadata elements: title, date, identifier and subject. byte utf8 = "<?xml version=\"1.0\" encoding=\"utf-8\"?>\n"
// "dc" instead of "dublin_core"
The output of this program was one directory for each image. Each directory contained the XTF-formatted Dublin Core metadata file (named $dc.identifier.other.dc.xml where $dc.identifier.other is the issue week) and the “pull” image plus other accessory files. This directory structure is the standard DSpace submission information package (SIP) configuration. The “.dc.xml” extension is recognized by XTF as a Dublin Core metadata file. When loaded into DSpace, the TIFF file names were disparate. Some were simply numeric (“064.TIF”) and others had varying prefixes (“FoS” or “FoS_”). To rectify this, another Java program was written to standardize the naming of the TIFF files in line with the metadata files i.e. $dc.identifier.other.tif, where $dc.identifier.other is the issue week. The main method (see Code Listing 2 below) which retrieves the identifier from the Dublin Core XML file uses the Java API for XML Processing (JAXP) . domFactory.setNamespaceAware(true); // never forget this! System.out.println ("** Parsing error" + ", line "
This naming convention and metadata file format standardization would assist in further processing and dynamic rendering of the images, as well as indexing for the search and browse interface. In keeping with the format of the comic strips, we aimed to make the style of the website very visual and high contrast. The faceted browse interface and search results would allow users to scroll through preview images in an image slider. These previews were created by processing the images output from the DSpace export using the OmniFormat (free) document conversion utility. JPEGs at 200px x 400px were created for scrolling in the image slider (see Figure 1 below) and we were very happy with the image quality. Zoomify is commercial software enabling zooming and panning of high-resolution images. The decision to purchase a commercial licence for ZoomifyDesign4-Win rather than code an image zoomer and panner in, for example, jQuery, was made due to time and resource constraints. Technically, this worked well in terms of development time. However, due to Zoomify being Flash-based, it meant that the site would not work on iPads or iPhones. This was an oversight at the time of development and the change over to jQuery for zooming could be a possible future site enhancement. Zoomify requires the creation of image “tiles”, which were created by dragging and dropping images onto the Zoomify Converter.exe program icon in Windows. This processing produced one directory corresponding to each TIFF image (as shown below), consisting of subdirectories of “tile groups”, collections of small JPEGs which are small portions of the original image. These tile group directories were then ready to be presented using the Zoomify viewer, a Shockwave Flash file which is bundled with Zoomify Design. At the University of Sydney Library we have used the eXtensible Text Framework (XTF) for several projects over the last few years and have found it to be flexible enough to meet our needs for developing customized search and faceted browse functionality for a variety of content types and metadata schemas. Having some expertise in creating XTF sites, we decided to use this open source platform for the search and browse functions of the Frontiers of Science site. Given the time and resource constraints, we wanted to keep things simple, so we pared down the full-featured XTF advanced search engine to allow searching only on keyword or title. We used the term “keyword” since the subject metadata values were not controlled. 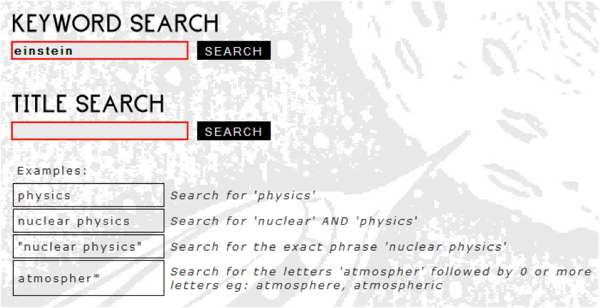 Figure 2 shows the simple keyword/title search forms page. Clear examples of available Boolean operations were provided. XTF comes with a highly configurable text indexing facility which we used to generate a Lucene index from the Dublin Core files. The Lucene index is read for searching by the “crossQuery” servlet. This is also highly configurable through XSL files and templates. The search engine produces a results page which is powered by XTF but which integrates the use of the JQuery Tools’ Scrollable module. Figure 3 shows the salient features of this search results page and the scrollable module. Firstly, the search itself is displayed on the right hand sidebar and the number of matches is shown. The results can be sorted by title or date. Through XTF’s faceted browsing feature, users are able to narrow their search results further. Once again, we decided to keep it simple, only defining “date” and “keywords” as faceted browse fields. Figure 3. Main features of the search results page. XTF uses XSL stylesheets to control and configure the Java classes which drive it. The main scrollable module is defined within an XSL template in $XTF_HOME/style/crossQuery/resultFormatter/default/resultFormatter.xsl, which is called on the condition that a search returns at least one match (“docHit” in Code Listing 3). Code Listing 3. The test for search term matches. The “scrollable” XTF XSL template defines container classes and ids such as “scrollable”, “thumbs”, “thumb” and “meta”, the styles of which are set in the two CSS files, “scroll.css” and “scrollable-navig.css”. The collection of pulls included some that had not been previously published and, therefore, had no publication date. A workaround was put in place for this – if the pull did not have a date greater than zero, instead of displaying a formatted date, the text “Unpublished” was displayed (see “unpublished material hack” in Code Listing 4). Once a user wishes to view a particular pull in detail, they may click on the JPEG (or its title). 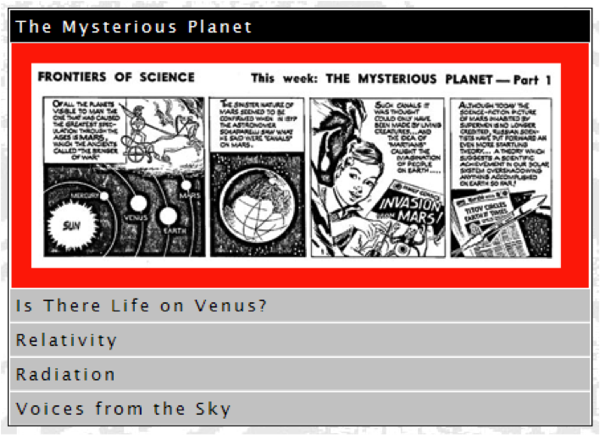 An overlay with zoom and pan controls then allows the user to view each week’s comic strip in detail. When the pull thumbnail or title is clicked in the scrollable component (from browse or search results), the XTF overlay XSL template (see Code Listing 5 below) is called to display the zoomable and pannable pull. Figure 4 shows the zoomed pull. The zoom and pan controls are shown at the bottom centre (green border), and the navigation window is shown at the bottom right of the overlay (yellow border). Figure 4. The Zoomify overlay showing zoom and pan controls, and the navigation window. The Zoomify window provides a convenient method of navigating through and reading the pulls and gives the user the opportunity to look in detail at the high resolution (tiled) images. Clicking on the “Close” link, using the “Esc” key, or clicking anywhere outside of the overlay window closes the Zoomify overlay window. 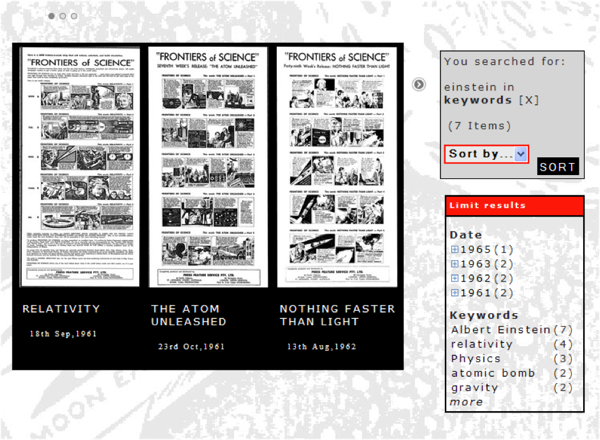 The home page features five selected strips presented in a vertical tabbed format (shown in Figure 5). Figure 5. Vertical accordion tabs on the home page. We used JQuery Tools accordion tabs (see Code Listing 6 below), with a “fade” effect, rather than sliding. Clicking on a strip title fades in that particular strip’s “thumbnail”. Clicking on the thumbnail itself employs the same methods as the search/browse functionality to display a zoomable and pannable pull. 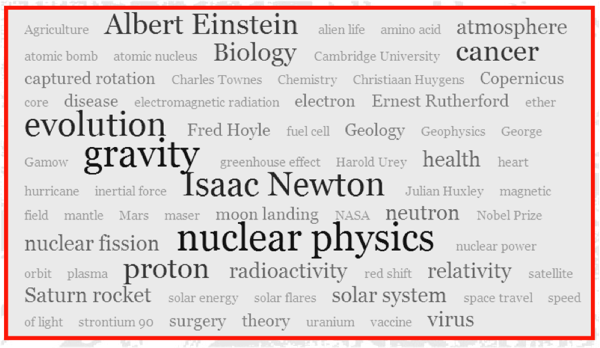 As an alternative method for browsing the archive, it was suggested that a tag cloud be developed. I like Steven York’s  approach to this, so I used a slightly modified version of his “accessible tag cloud in PHP and CSS (with MySQL)”. Our “tags” were embedded in the $dc.identifier.other.dc.xml files, so a Java class (TagCloudFromDC.java) was written to extract the list of tag values from them, once again using the JAXP. The program outputs a flat text file with one tag per line, by traversing a directory of the dc.xml files. Steven York’s PHP code was then modified to generate the HTML for the tag cloud from this text file (see Figure 6). Aside from its functionality, the website needed to be attractive in a way that reflected the history of the strips. Hence, the fonts chosen were those that were in keeping with the style of the original comic strips. Images for the site headers and page background were actual cropped portions of the original pulls. The colors used were exciting and bright to denote the entertaining aspect of the content. The copy itself was also written in a fun, lighthearted, but informative sense to match the mood of the strips. The general styles and layout were loosely based on the University of Sydney stylesheets, so there were some constraints on the graphic design. Part of what made it possible to create this site within a limited time was our established infrastructure. At the University of Sydney Library, we have a base XTF server setup using VMWare. This virtual machine comes pre-packaged with all the components required to run an XTF website (see Table 1 below), including XTF itself. We can create an XTF clone, implement name changes, firewall rules and DNS setup, usually within 3 hours. We have also seen traffic peaks during times of media interest, such as the Frontiers of Science exhibition (and comic drawing competition) at the University of Sydney SciTech Library in February 2011. This points to the value of marketing and media used creatively in conjunction with the website. Of course, there are budgetary constraints on these activities. In some cases, CSS code for the layout and styling proved difficult and was less than ideal. For example, aligning the search/limit results boxes with the JQuery Tools scrollable component could be better. Also the arrows for scrolling were not clear to some users, but changing them would have taken some time. These issues may have been avoided had the project received more funding for technical staff (I was the sole programmer available to work on the site, along with my other existing projects). One of the major enhancements planned for the site is using OCR to scan the original pulls and obtain full text for indexing. Full text searching would then be a possibility. Digitization and tagging of additional pulls is also yet to be done, to expand the current database of material available. In addition, we are currently in the process of migrating our server Java environments from Sun JDK to Open JDK. Pending funding, there is also the possibility of video interviews and other multimedia additions to the site. Social networking and blogging would also be valuable tools for the future of the site, allowing greater user interaction with the site and with the general and academic community. Judy Campbell and Professor Bob Hewitt – initial ideas. Julie Price and Nicholas Heath, Rare Books & Special Collections Library, University of Sydney – site planning and scanning of pulls. Susan Murray-Smith, Sydney eScholarship, University of Sydney – finalizing contracts. Alison Muir, Science Foundation for Physics – grant to enable digitization. Abbie Thomas, ABC Science – Frontiers exhibition. Digital and Print Media, University of Sydney – advice on University of Sydney style guidelines. Miriam Butler and Angela Raymond – rights and licensing. Professor Peter Harrowell – for tagging of the pulls. Gary Browne (gary.browne@sydney.edu.au) is a development programmer for Library IT Services and Sydney eScholarship at the University of Sydney Library. He enjoys the challenge of cobbling together bits of code to produce things of simple, functional beauty. Gary is interested in the application of web technologies to improving the end-user experience. 10 Responses to "Web-Based Software Integration For Dissemination Of Archival Images: The Frontiers Of Science Website"
Thanks for your feedback. Granted, the site is not ideal in this respect. This stems from the difficulty of balancing several projects at once, tight deadlines and conflicting user requirements by which one is bound. I have attempted to acknowledge this in the article. Thanks also for your development tips, they are much appreciated. I hope I do get some time in the future to improve the site further in terms of accessibility. I like this because it’s highly functional and extremely useful for the user. I’m going to have to go over the information a little bit longer, but at least it’s all here. Thanks for taking the time to write this up! Glad this information is useful to you. Wow, this is amazing. I never knew you could make scrollable previews like that. Just looking at all the code to produce this, sorta makes my head explode, but i’m definitely bookmarking this for reference! So cool, how much time did you spend on this? The site was done in 6 weeks, not including digitisation of the strips. The jQuery Tools library is great to work with, I used it for the scrollable thumbnails. I combined that with the search capabilities of the eXtensible Text Framework (XTF). Awesome, just checked out the live site. I love the zoom effect when you click on the comic strips. Thanks for the feedback. Zoomify is pretty easy to work with, though next time I’d be more likely to use or write a jQuery plugin.